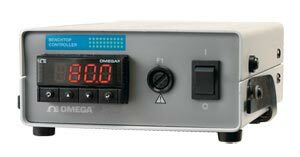 The CSi32 Series is Omega's benchtop controllers. They feature a 1/32 DIN size (96 x 48 mm) digital panel controller in a rugged benchtop metal enclosure. The controller used is Omega's award winning and patented iSeries with color-changing display. The iSeries meters feature the only LED displays that can be programmed to change color between RED, GREEN, and AMBER at any setpoint or alarm point. Other options include, serial communications. These controllers can be purchased with the input factory configured for one of 10 common types of thermocouples, multiple RTD types, or process (DC) voltage and current. They are ideal for laboratory use and applications requiring portable temperature and process control. Pre-wired input and output receptacles in the rear of the case enable quick and easy connections to power, input, power output and digital communications. The iSeries are full PID controllers with Autotune and can also be programmed for On/Off control via the front panel or through the use of a PC and the free configuration software. The iSeries configuration software is designed to interface with the any of the iSeries controllers and the CSi32 Series benchtop controllers with optional communication hardware.